Just a couple of months ago, the top U.S. commander in the Middle East said Iraq's Shiite militias have American blood on their hands and he hoped today's U.S. strategy to defeat the Islamic State extremists will not involve an alliance with those groups. "Three tours in Iraq commanding troops who were brutalized by some of these Shia militias ... I will not — and I hope we never — coordinate or cooperate with the Shia militias," Army Gen. Lloyd Austin, chief of U.S. Central Command, told the Senate Armed Services Committee on March 26. But after the demoralizing fall of the city of Ramadi to Islamic State forces a few days ago, the U.S. faces a hard choice: Agree to possibly provide airstrikes in support of the Shiite militias that are preparing a counteroffensive or risk allowing the Islamic State to consolidate control over the strategically important city. 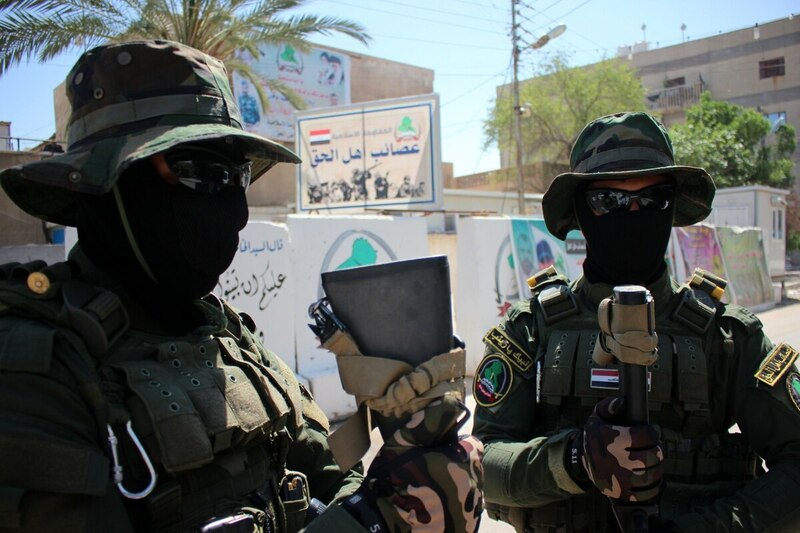 Several thousand Shiite militiamen reportedly are streaming into Sunni-dominated Anbar province. Iraq's Shiite Prime Minister Haider al-Abadi publicly called for the groups, known as Popular Mobilization units, to go west and help the Iraqi army forces prepare for an imminent attack on Ramadi. Many military experts believe the Shiite militias are essential to winning that fight. Some of those Popular Mobilization units likely include fighters linked to groups that targeted U.S. troops during the eight-year U.S. occupation, which ended in 2011. For now, U.S. Central Command officials are not ruling out potential support for the Shiite groups if they agree to cooperate with the Iraqi military. "We're going to provide air cover to all forces that are under the command and control of the government of Iraq," Air Force Col. Patrick Ryder, a CENTCOM spokesman, told reporters Wednesday. That signals a significant shift, said Ramzy Mardini, a former State Department official and a nonresident fellow at the Atlantic Council. "The U.S. has effectively changed its position, coming to the realization that Shiite militias are a necessary evil in the fight against ISIS," Mardini told Military Times in an email Wednesday. U.S. officials say they will "continue bombing ISIS targets as long as the Shiite militias are integrated as part of a command-and-control structure answering to the central government [of Iraq], but this structure could be just something on paper, not an actual institutional development playing out on the ground," Mardini said. A similar situation arose in March when thousands of Shiite militiamen mounted an attack on the Iraqi city of Tikrit. At the time, Iraqi officials claimed to be in command of that fight, but some of those militias appeared to be under the command and control of Iran; the commander of Iran's Revolutionary Guard was photographed alongside some of those troops near the battlefield. The U.S. did not provide airstrikes and remained uninvolved in that operation until those Shiite militias withdrew. After a three-week operation failed to dislodge the Islamic State extremists, thousands of Shiite militiamen did withdraw. Iraqi army regular forces moved in and, with the help of American air support, seized the city. When asked about Austin's comments in March, the CENTCOM spokesman said Wednesday that Austin was concerned about the Shiite units' loyalty to Iran. "What he said, basically, was that there are certain groups that were not under the command and control of Iraq and that were essentially operating as proxies for other powers in the region, Ryder said. "And again the bottom line here is this is Iraq's fight, an Iraqi-led fight and we will work with the government of Iraq and we will support forces that are under their command and control." The U.S. strategy for defeating the Islamic State, also known as ISIS, hinges on the belief that tamping down sectarian tensions will encourage the Sunni population to reject ISIS and support an Iraqi central government that shares power between Sunnis and Shiites. U.S. officials fear that Shiite militias mounting offensive military operations in predominantly Sunni areas will retaliate against local Sunnis, inflame sectarian tensions and inadvertently fuel the Sunnis' support for the Islamic State militants. But the current crisis may be forcing U.S. officials to take a pragmatic look at its reluctance to support groups backed by Iran, said James Jeffrey, a former U.S. ambassador to Iraq who is now a fellow at the Washington Institute for Near East Policy. "I would lift perhaps the restriction on even the more Iranian-backed [militias] if we have good reason to believe they won't run amok among the Sunni population, because we are in a crisis here with humanitarian (thousands of pro-government Sunni families in Ramadi) as well as military aspects," Jeffrey said in an email to Military Times on Tuesday. If the U.S. shift toward accepting the Shiite militiamen's role heralds a long-term change, the U.S. and Iraqi governments should hammer out a more formal arrangement, said Michael O'Hanlon, a national security expert at the Brookings Institution. "Looking ahead to Mosul and beyond, there needs to be some fuller discussion of, what is the way to get some degree of regulation over the militias?" O'Hanlon said in an interview. "I'm not so puritanical as to dismiss the use of airpower to support some of these groups. But I'd rather see if we can't rehab some of the ones we think we can work with into a national guard quickly."